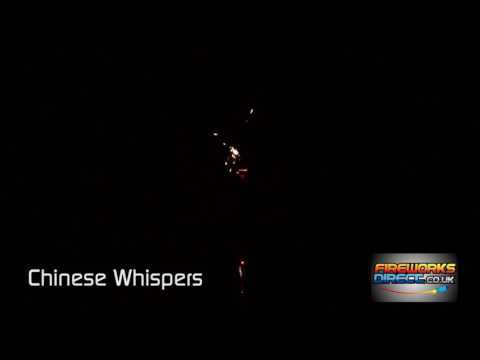 Chinese Whispers is a low noise multishot firework which starts with a pretty red and crackling fountain and then follows on with ariel shots of colourful flying fish, falling leaves, strobing mine lifts and silver comet tails. It finishes with a volley of glittering horsetails. This firework is perfect for young children, the elderly or pet owners who don't want a lot of noise but still want to enjoy fireworks. If you’re looking to buy multi-shot fireworks online, this cake is a great choice. With our fantastic fireworks delivered straight to your front door, or click and collect available from Hertfordshire or Oxford, we make it easy to buy firework cakes online all year round. Simply place an order or give our friendly team a call to find out more about the fireworks for sale at Fantastic Fireworks. This multi-shot / cake firework is of the high quality that you would expect from the team at Fantastic Fireworks. Plus, this firework uses a single ignition fuse, so you will only need to light is once! When looking for multi-shot fireworks for sale, you need not look further. Furthermore, we offer multi-shot firework delivery all year round, so whenever you buy fireworks, we can deliver straight to your door. At Fantastic Fireworks you can buy fireworks online or from our firework shop. We have fireworks for sale all year round.